In conjunction with the upcoming National Day celebration (25 August – 16 September 2018), honor Malaysia, the leading global smartphone e-brand, rejoices Malaysians through a series of campaign offers for every purchase made on selected honor models and gadgets. Each purchase of the offered products will qualify customers for a special lucky draw to win the grand prize of five Petrol gift cards worth RM5,000 each, and 20 consolation prizes of AEON shopping voucher worth RM200 each. The total amount of purchase dictates the number of lucky draw tickets for each customer. 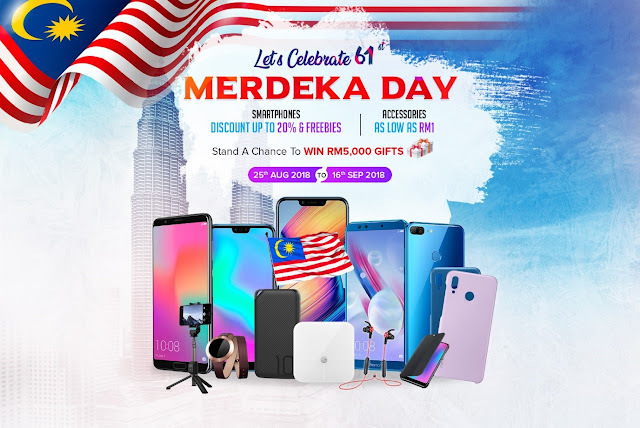 For more information on the Merdeka Campaign Offers, please visit honor’s official e-commerce website and official Facebook page.